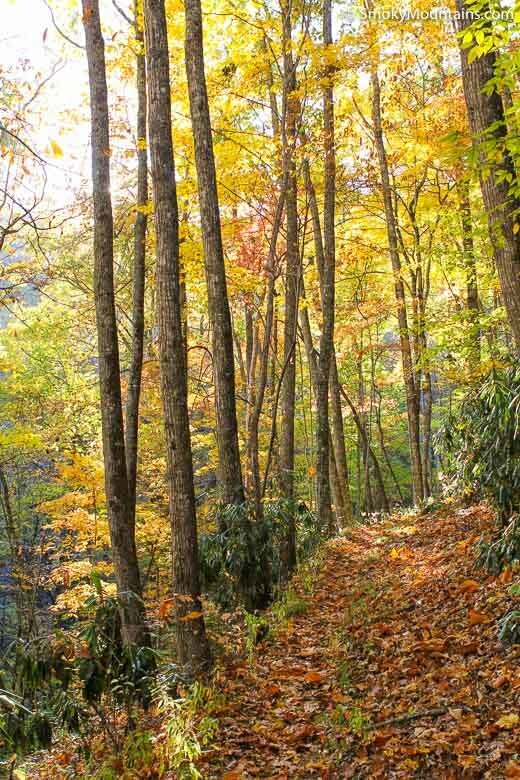 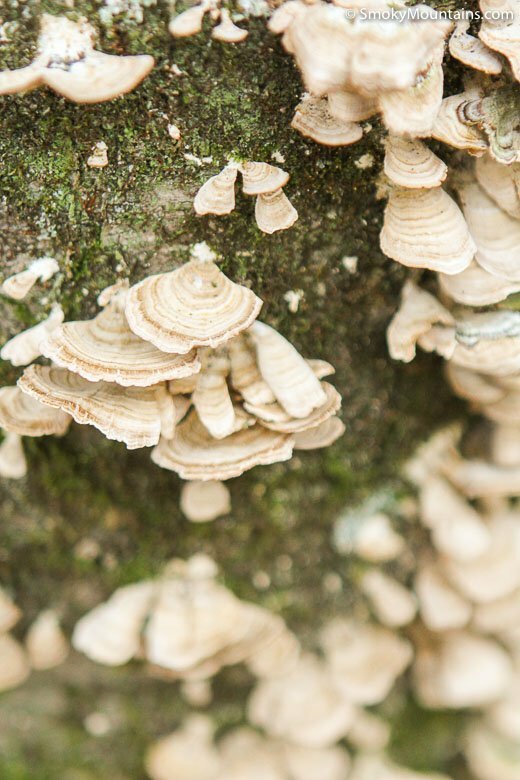 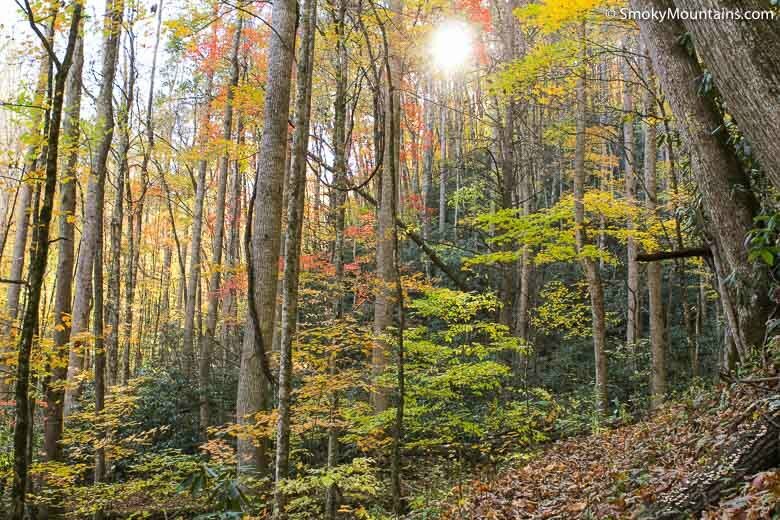 Easily reached along Newfound Gap Road, the Kanati Fork Trail is one of the leading hikes in Great Smoky Mountains National Park for forest wildflowers. 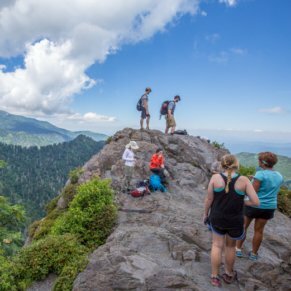 It’s a bit on the demanding side as you zigzag upstream to a Smoky Mountain ridge, and long views are scarce. 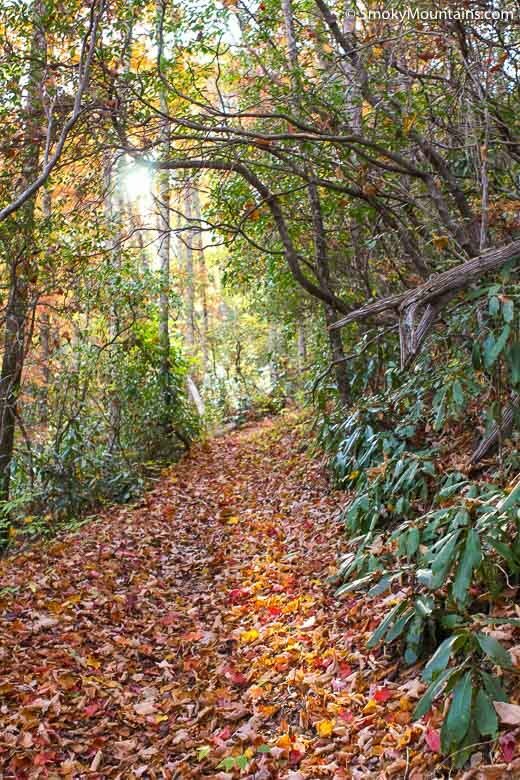 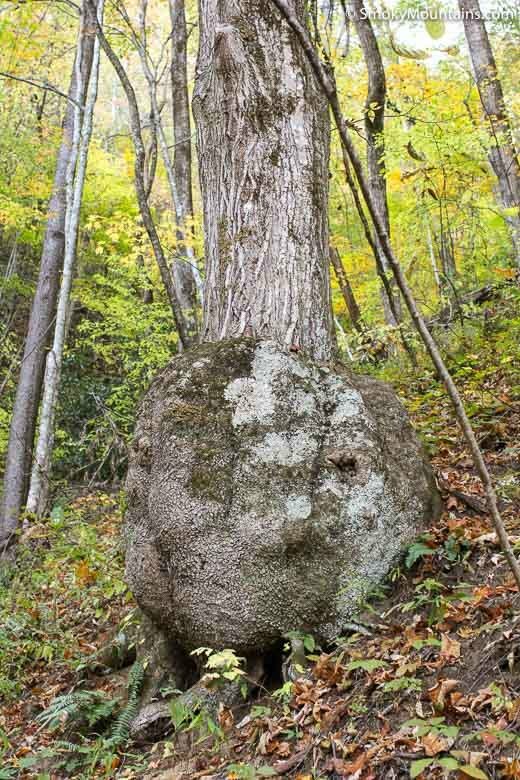 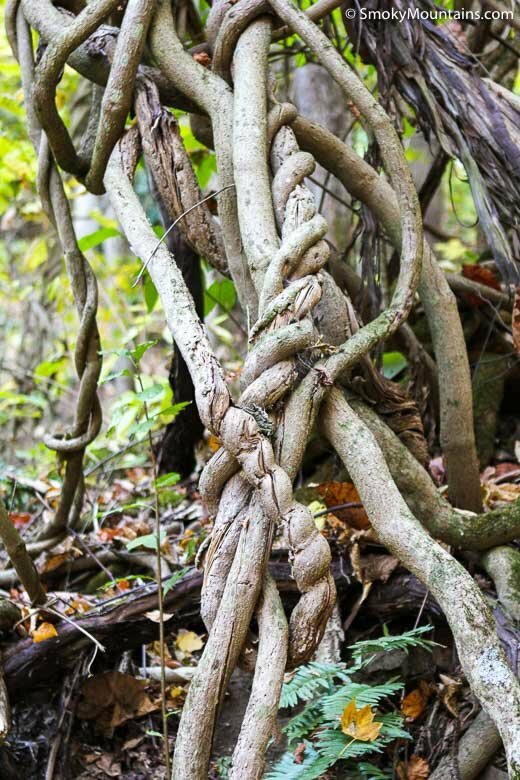 Intimate pleasures, though, come easy in these fetching woods: from blazing blooms and autumn leaves to the lush moss of a feeder creek. 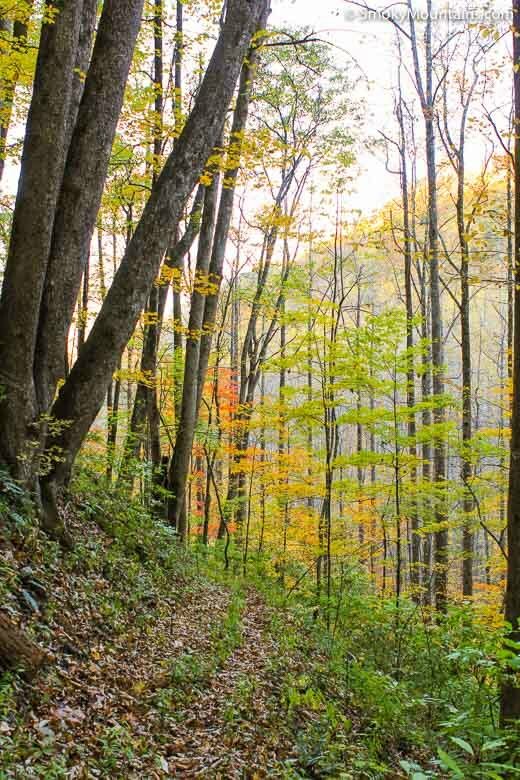 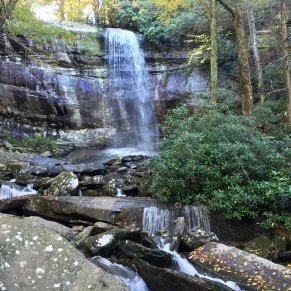 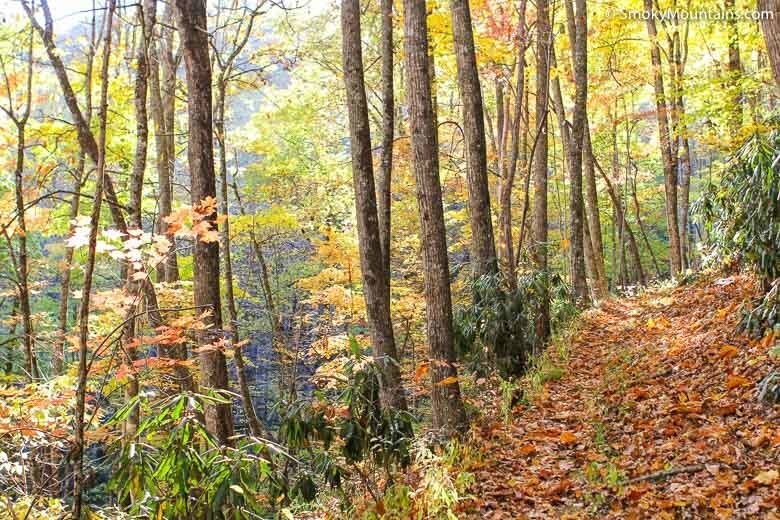 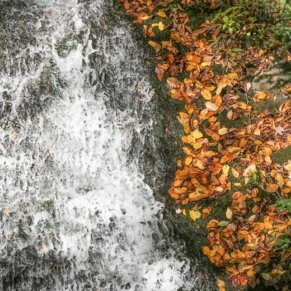 An invigorating mountain climb, the Kanati Fork Trail loosely follows one of the headwater branches of the Oconaluftee River from Newfound Gap Road to Thomas Ridge. 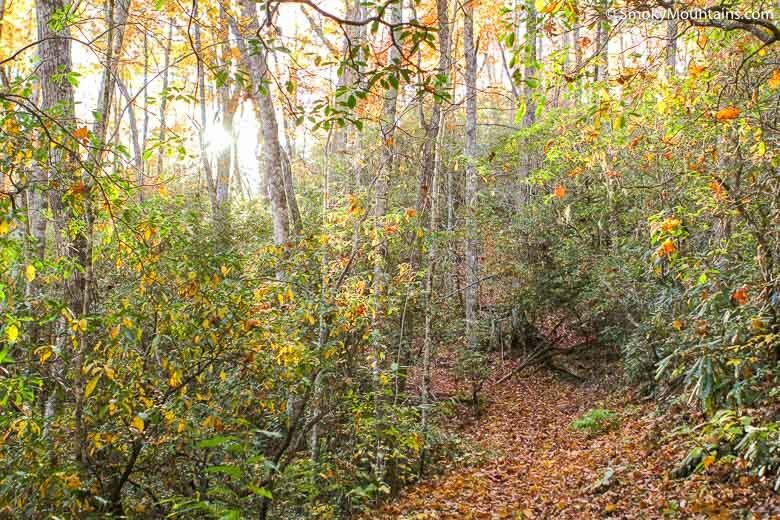 It’s a fantastic spring-through-summer route for wildflowers, and certainly a backwoods adventure year-round. 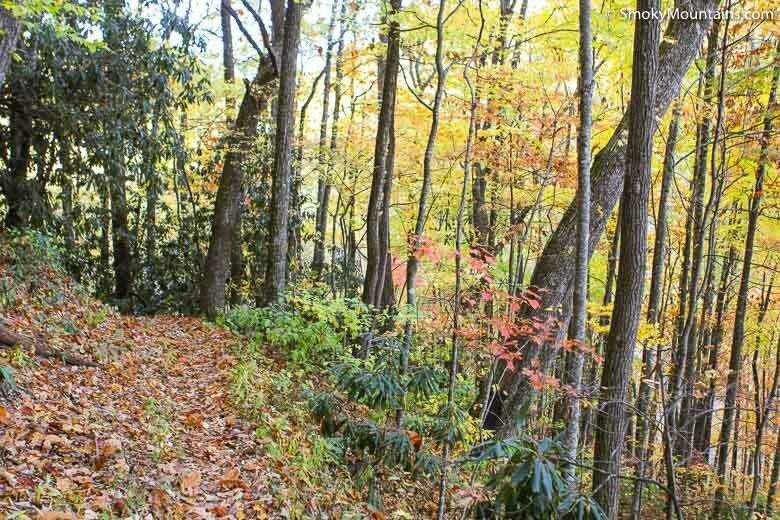 This is a fairly challenging trek due to its 2,100 or so feet of elevation gain across 2.9 miles (for a round-trip distance of 5.8 miles). 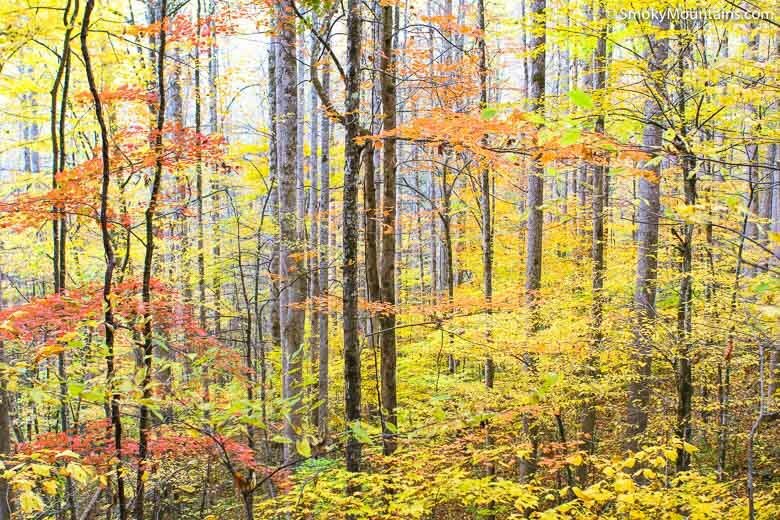 Give yourself half a day at least, particularly during the bloom season: You’ll probably be cracking out that flower field guide and snapping plenty of photos, after all. 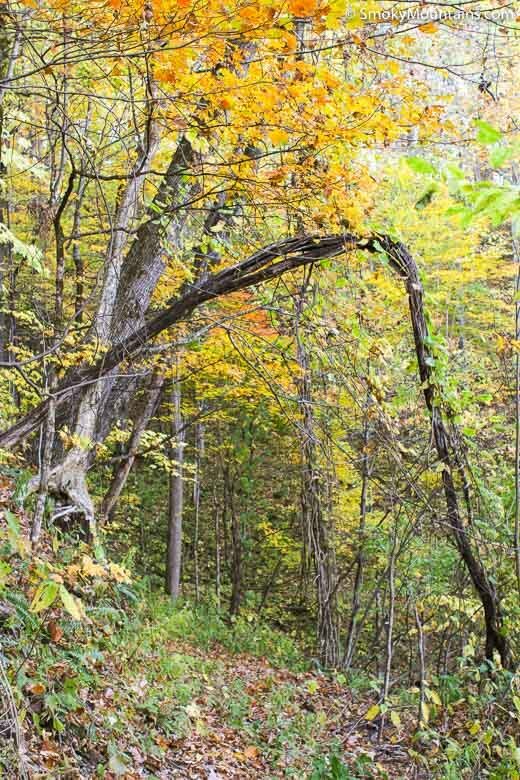 For its first portion, the Kanati Fork Trail heads upslope within shouting distance of its namesake stream. 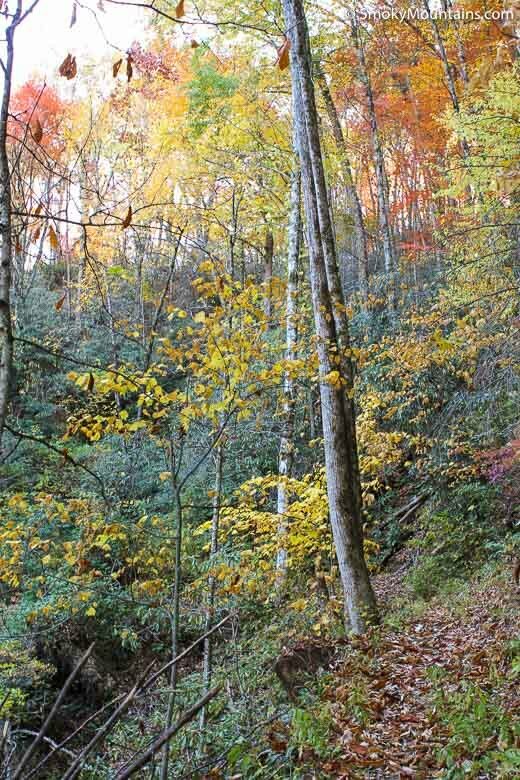 The Kanati Fork drops off Thomas Ridge, aka the Thomas Divide, and flows northeastward to a confluence with Beech Flats Prong that helps form the Oconaluftee mainstem. 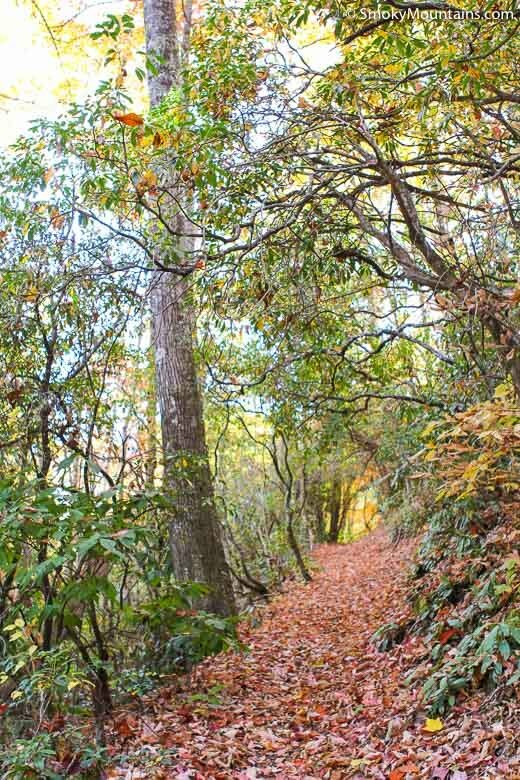 You’ll be keeping your distance from the waterway, though its visible from the early part of the trail through the leafless woods of winter. 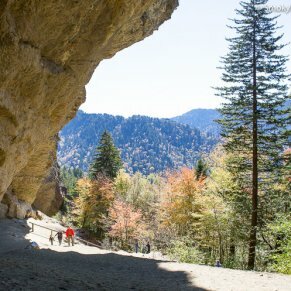 You’ll soon start switchbacking up the western walls of the Kanati Fork canyon, crossing small tributaries tumbling through handsome cove hardwood forest. 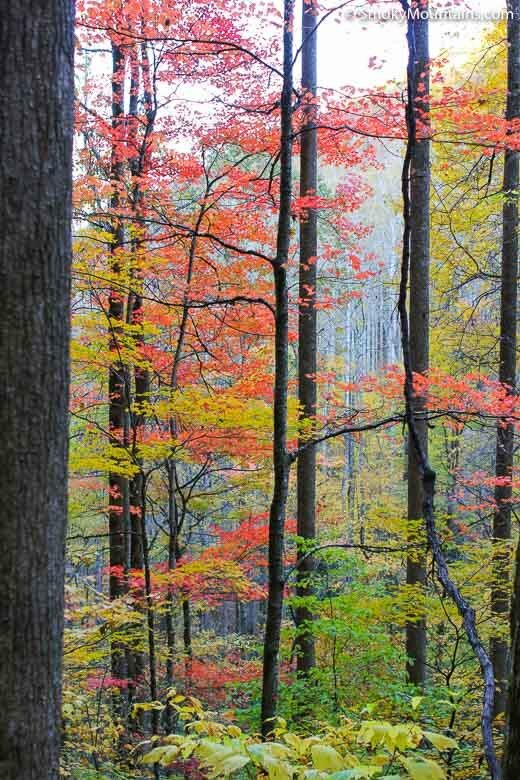 The stately trees include tulip-poplars, eastern hemlocks, yellow birches, magnolias, maples, and basswood. 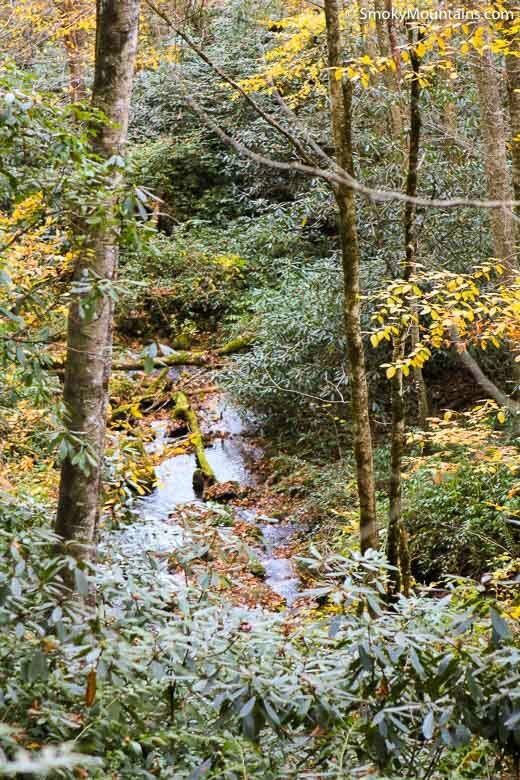 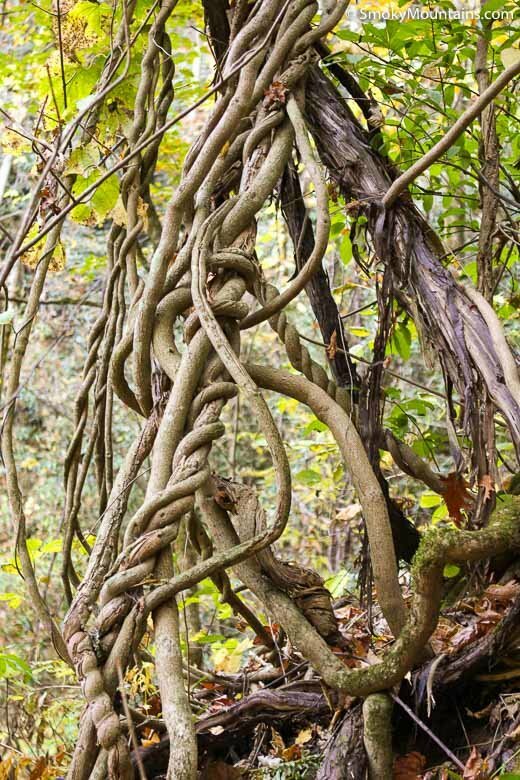 Among the prominent shrubs closer to the streamcourse are rhododendrons, mountain laurel, and doghobble. 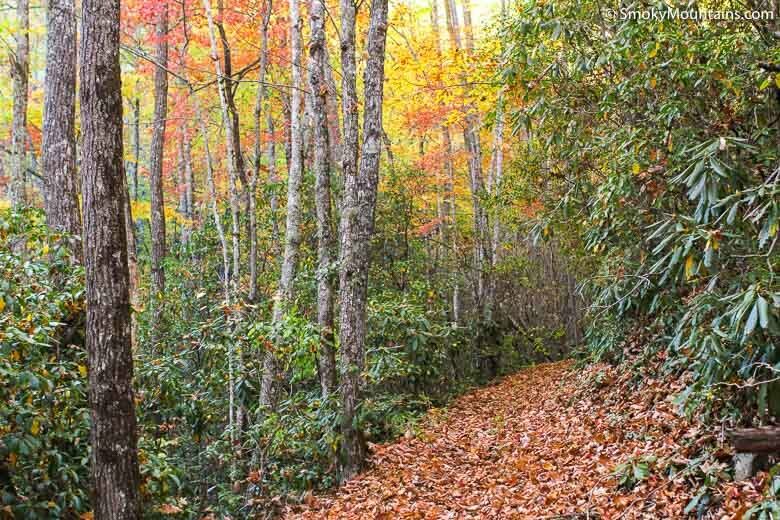 The first couple of miles of the Kanati Fork Trail in particular serve up one of the best wildflower shows in the Great Smokies. 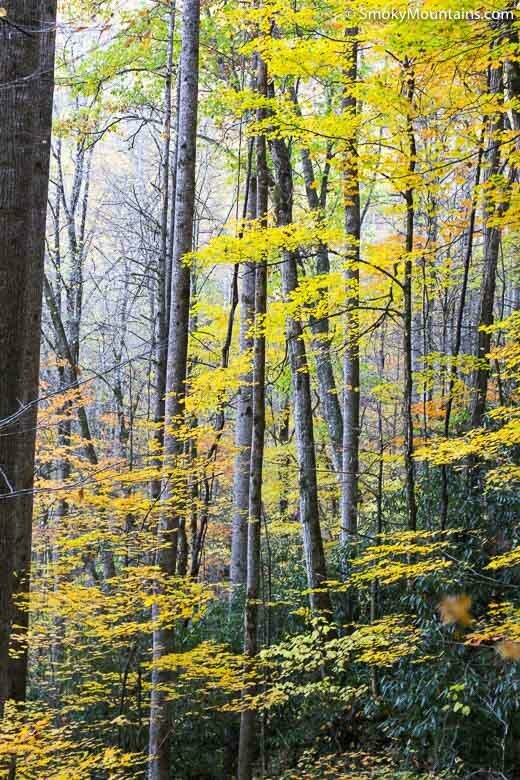 It begins as early as March, really explodes in April, and rolls onward into the summer with a shifting cast of botanical characters. 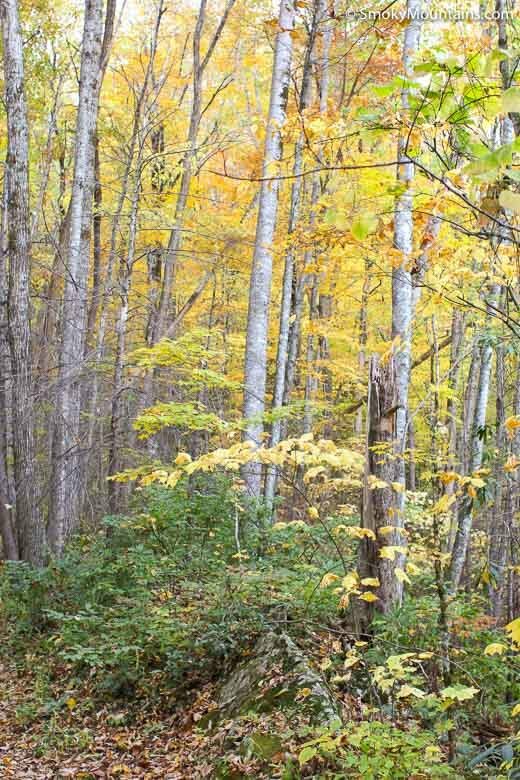 The groundcover carpet includes trilliums, violets, Dutchman’s breeches, rattlesnake plantain, trout lily, false Solomon’s-seal, and many others. 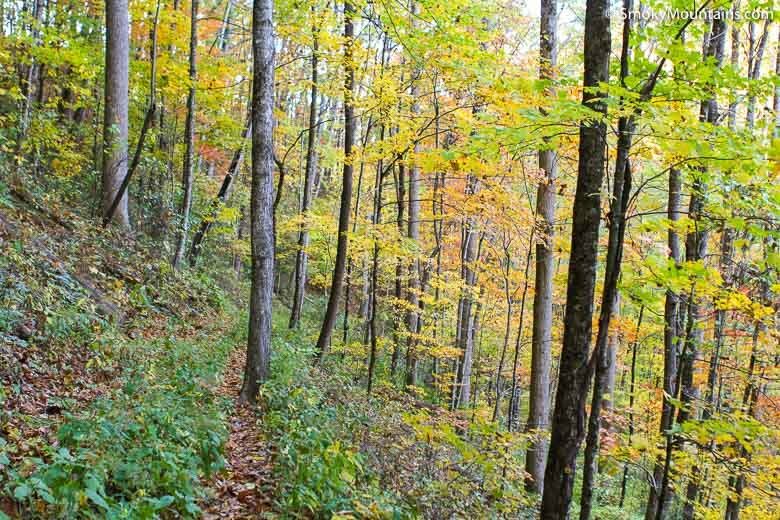 Roughly a mile in, you’ll angle up and above a tributary stream’s ravine to assume a higher route on the canyon slopes. 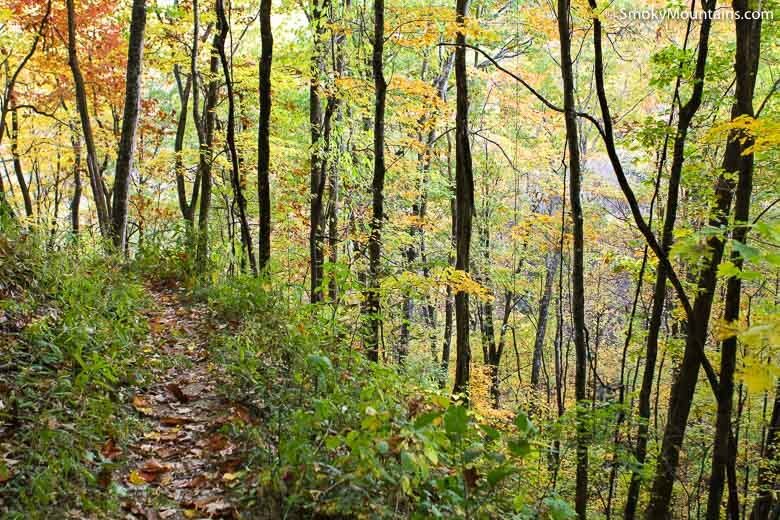 Eventually you’ll turn south along the “headwall” of the Kanati Fork canyon, making a sharp final switchback to reach the spine of Thomas Ridge. 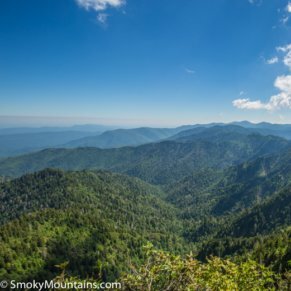 Here on the ridge top the Kanati Fork ends at its junction with the north-south Thomas Divide Trail. 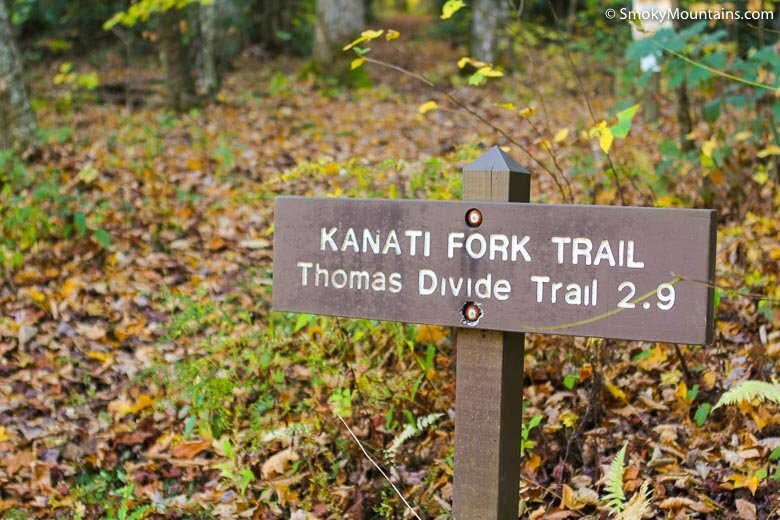 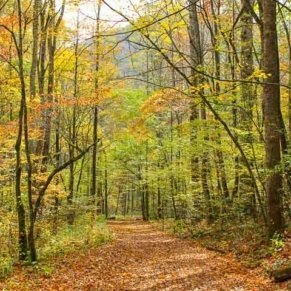 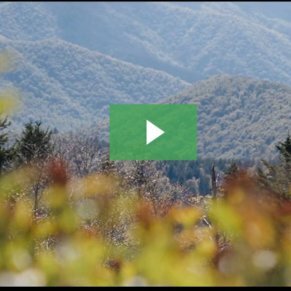 -Instead of doing an out-and-back, you can easily convert the Kanati Fork into a 4.7-mile shuttle hike by leaving a car at the northern trailhead for the Thomas Divide Trail along Newfound Gap Road. 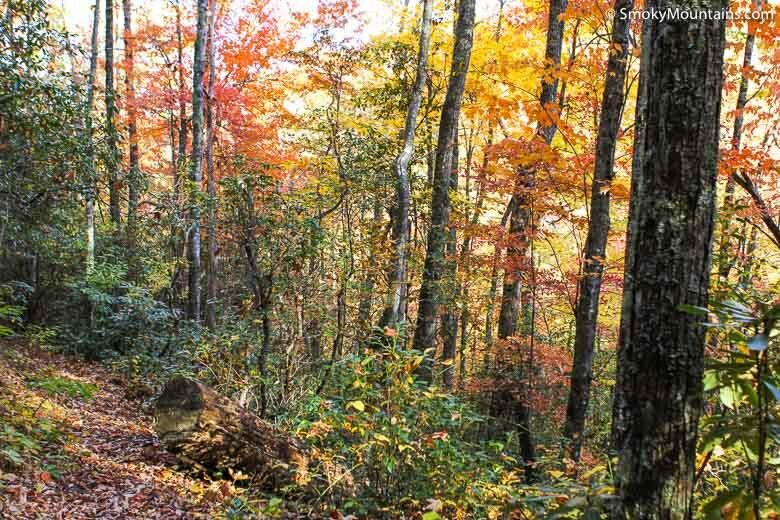 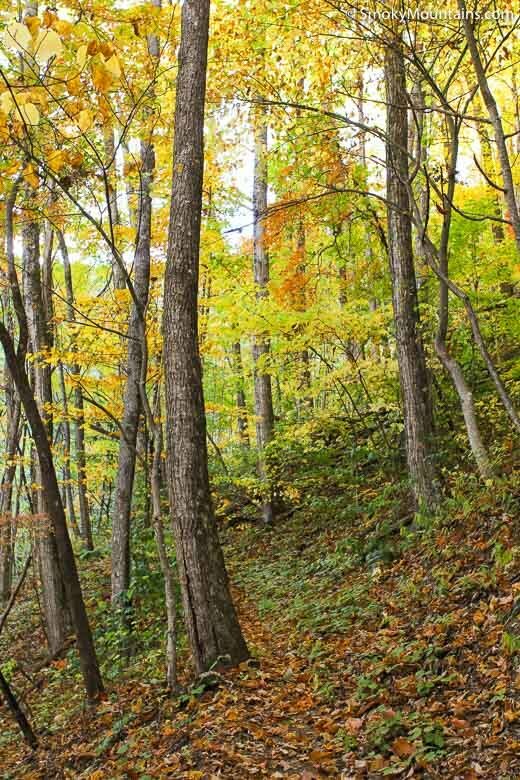 -It may get more attention as a wildflower hike, but the Kanati Fork Trail also presents some nice fall colors on the other side of the calendar, given the diversity of hardwoods here. 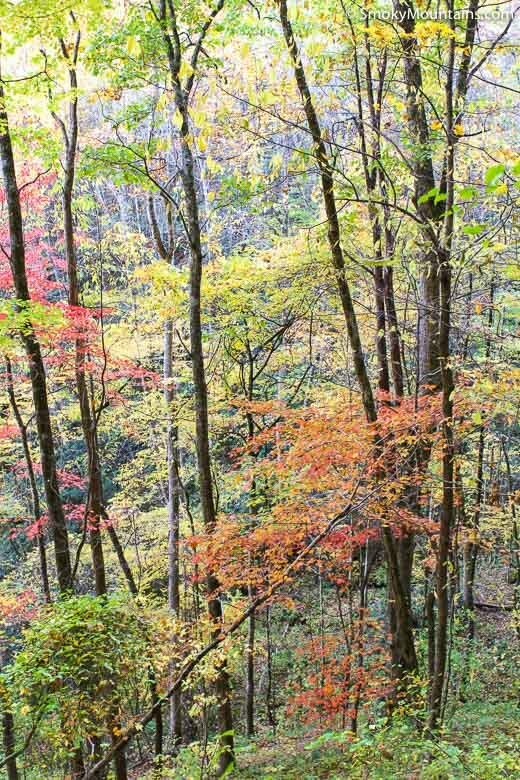 From downtown Gatlinburg, take the main Parkway (441-S) into the National Park – the road turns into Newfound Gap Road. 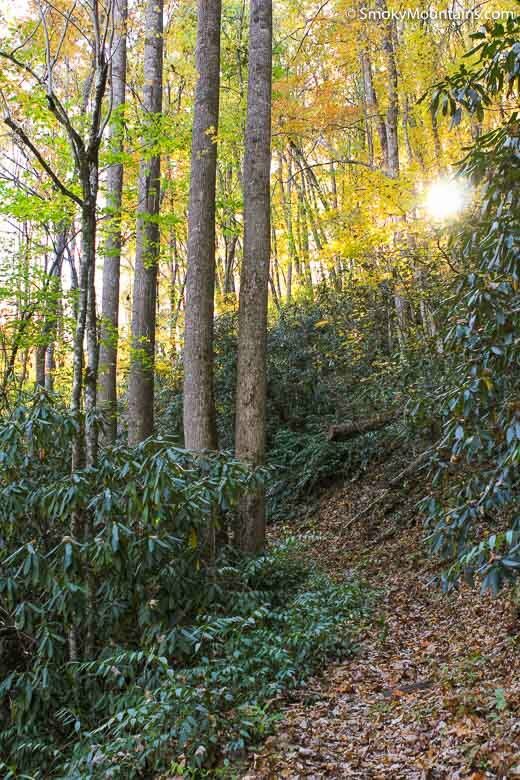 As you pass the Sugarlands Visitor Center on your right, take note of your mileage. 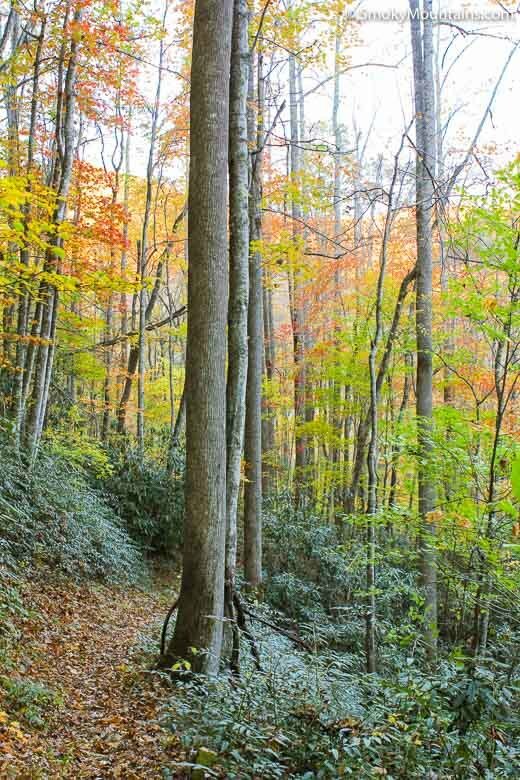 Continue for 21.3 more miles on Newfound Gap Road and your trail parking will be on the left side.